​Progress has been made toward understandingthe physiological mechanisms that underlie Gulf War illness and identifying possible treatments, according to a report released Monday by a Congressionally mandated panel of scientific experts and veterans. ​Treatment research has increased significantly since 2008, and “early results provide encouraging signs that the treatment goals identified in the 2010 Institute of Medicine report are achievable,” theResearch Advisory Committee on Gulf War Veterans’ Illnesses (RAC) said in a report presented Monday to VA Secretary Eric Shinseki by the Committee’s scientific director, Roberta White, chair of environmental health at the Boston University School of Public Health. The Institute, part of the National Academies of Sciences, had forecast that “treatments, cures, and hopefully preventions” could likely be found with the right research. The RAC report updates scientific researchpublished since the Committee’s landmark report in 2008, which established that Gulf War illness was a real condition, affecting as many as 250,000 veterans of the 1990-91 Gulf War. “The conclusions of the 2008 RAC report had a substantial impact on scientific and clinical thinking about Gulf War illness, as well as the public acceptance of this disorder,” said White. The earlier report documented a number of studies that found evidence linking the illness to exposure to pesticides and pyridostigmine bromide (found inanti-nerve gas pills given to troops), as well as other toxic sources. Exposure to the nerve gas agents sarin andcyclosarin has been linked in several studies to changes in magnetic resonance imaging (MRI) that are associated with cognitive impairments --further supporting the nervous-system effects of those agents cited in the 2008 report. “The Committee concludes that the evidence to date continues to point to alterations in central and autonomic nervous system, neuroendocrine, and immune system functions,” the report says. Studies also continue to show that Gulf War illness is not associated with psychological stressors during the war, the panel said. Rates of PTSD and other psychiatric illnesses in Gulf War veterans are far below the rate of these disorders in veterans of other recent wars, and far below the rate of Gulf War illness. 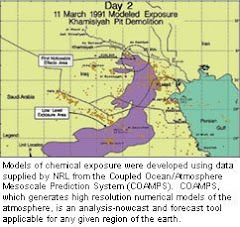 In addition, the Committee said, new evidence has emerged suggesting that certain exposures may be linked to brain cancer in Gulf War veterans.Studies show that veterans who were most exposed to the release of nerve gas during the destruction of the Khamisiyah arms depot in Iraq have significantly elevated rates of death due to brain cancer. Veterans who were exposed to the highest level of contaminants from oil well fires also have increased rates of brain cancer deaths, the report says. The panel cited a number of “promising” treatment studies, including those testing certain dietary supplements, intranasal insulin, andcontinuous positive airway pressure to ease fatigue and pain and improve cognitive function. While the RAC panel applauded an increase in the number of treatment studies funded by the Department of Defense’s Congressionally Directed Medical Research Program, it expressed grave concerns about a lack of research on other health problems and mortality among Gulf War veterans. “Very little research” has been conducted to determine rates at which veterans have been affected by neurological diseases such as multiple sclerosis or Parkinson’s disease, cancers, and reproductive problems, the panel said. “No comprehensive information has been published on the mortality experience of U.S. Gulf War era veterans after the year 2000,” according to the report. 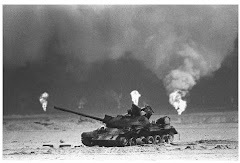 Gulf War illness refers to the chronic symptoms that affect veterans of that conflict at markedly elevated rates, compared to other veterans’ groups and to the U.S. population as awhole. Symptoms can vary from person to person, but typically include some combination of widespread pain, headache, persistent problems with memory and thinking, fatigue, breathing problems, stomach and intestinal symptoms, and skin abnormalities. ​The RAC report was presented at 10:30 a.m. Monday, April 28, at a public meeting of the Committee in Room 230, VA headquarters, 810 Vermont Avenue, Washington, DC. Guest speakers included U.S. Rep. Mike Coffman, a Gulf War veteran and chairman of the House Veterans Affairs Committee oversight and investigations subcommittee, and AMVETS national executive director Stewart Hickey, also a Gulf War veteran.